When I think about the solitary eating adventures I’ve had in my life, I remember distinctly the one that started it all for me. Close to 15 years ago, when I first started coming to LA, I had a night alone and didn’t know how to spend it. The thought of eating alone back then was a bit daunting. But the thought of missing out on great eating because I was alone helped me overcome any fears I had. I chose to go to Matsuhisa because I remember seeing Nobu on the Martha Stewart show and then reading about him here and there in magazines, (I guess this is how I got my food inspirations back before the interweb). I thought that I could to the restaurant and sit at the bar, and it wouldn’t matter if I was alone or not. 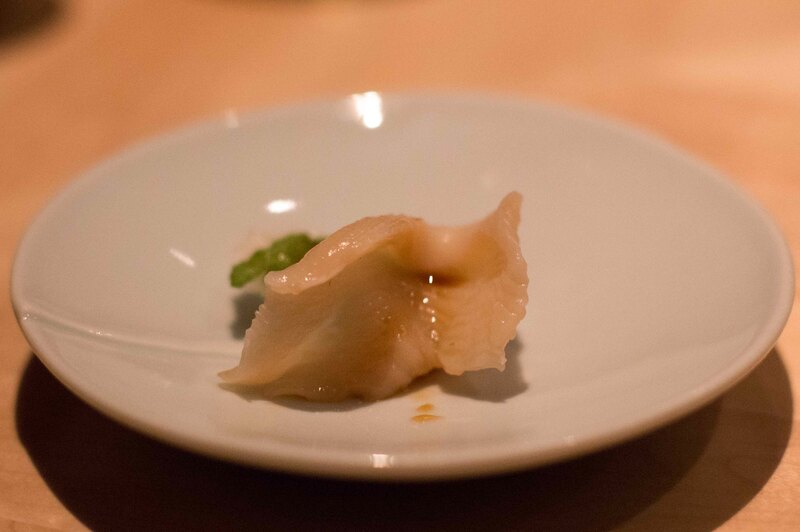 I was right in my rationale and enjoyed an evening of indulgence while talking to the sushi chefs behind the bar. I didn’t have to compromise on what I was ordering, and had a great array of things that most people might turn their noses up to. It’s actually amazing to think of how far sushi has come in the past 15 years, where back then uni was “challenging” to most. 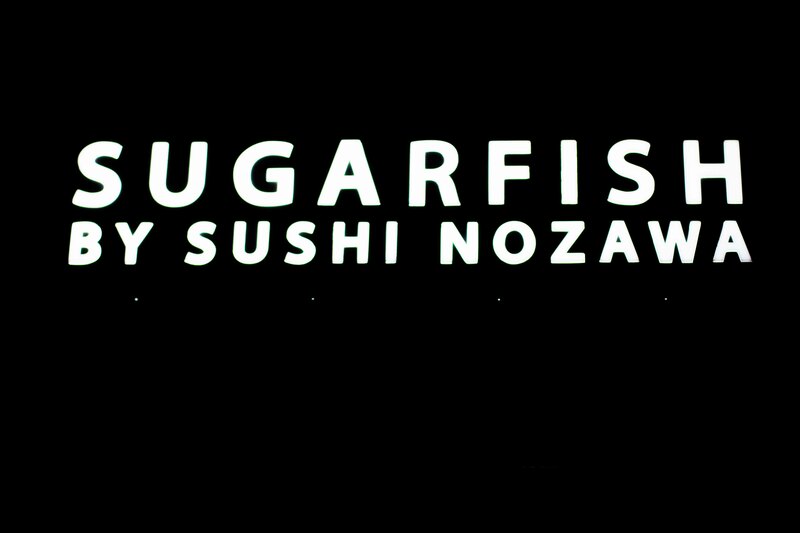 Now authentic and “good” sushi is so mainstream. 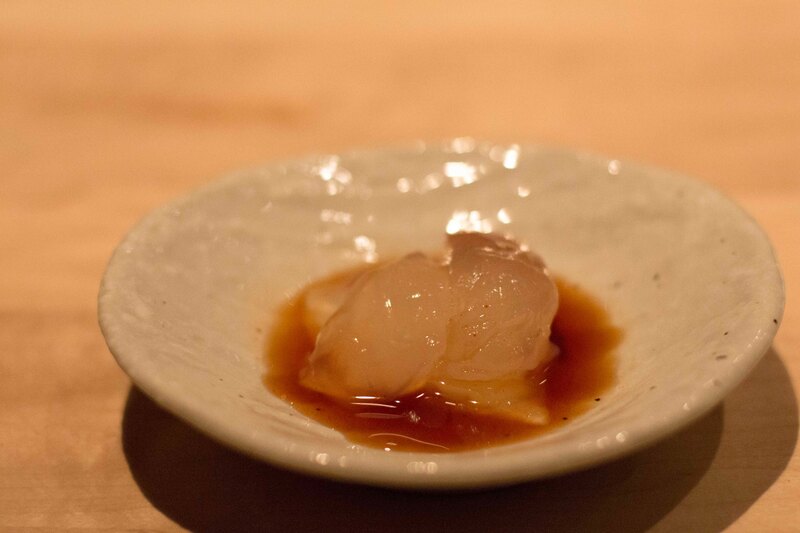 This time, I chose Nozawa Bar because of the intimacy of it’s 10-seat bar and because of location and price point. And to top it off, I was able to easily make a reservation for 1, which is sometimes hard to do. As the meal started, one of the diners introduced himself and then asked that the 9 of us around the bar introduce ourselves as well. All the others were couples on dates to celebrate something and what followed was lots of sake shared around the room throughout the evening. 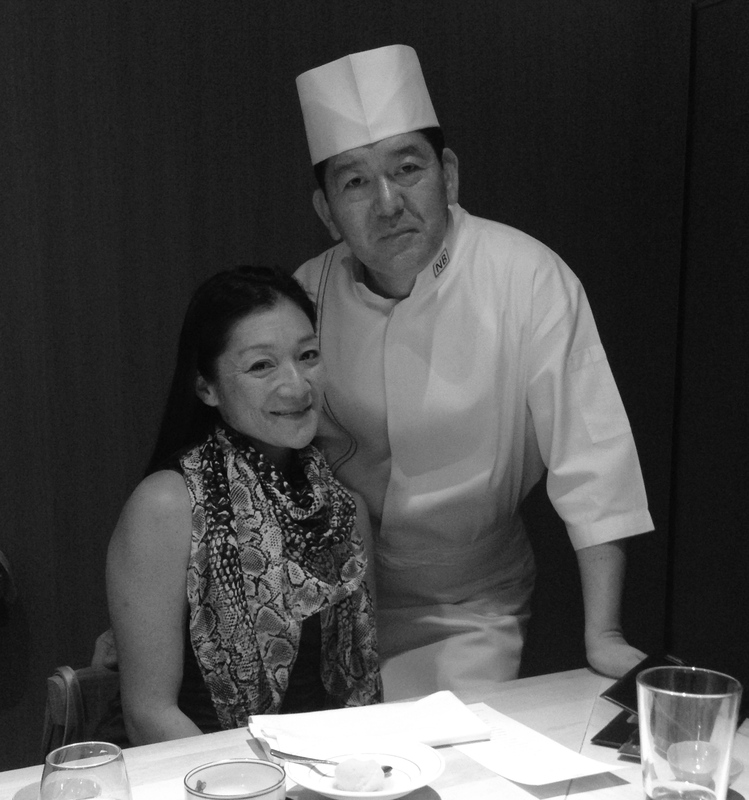 The conversation between diners and with Chef Fujita-san was different from anything I’d experienced before at an omakase meal at a sushi bar. The joviality of the room was the complete opposite of my solitary sushi experience in Tokyo. The great thing about eating solo at a sushi bar, is that you’re never alone. At the very least, you will interact with the chef behind the bar, but this case, I was entertained all night by the group I ate with. Fujita-san started carefully slicing pieces of Tahitian Bigeye toro and I was mesmerized with his movement as he skillfully cut through the pieces of silky tuna. I was lost in the moment and felt a giddy anticipation, knowing that the piece of toro was going to start me on a magical journey. When the piece was placed in front of me, I couldn’t wait and carefully picked it up and placed it in my mouth. 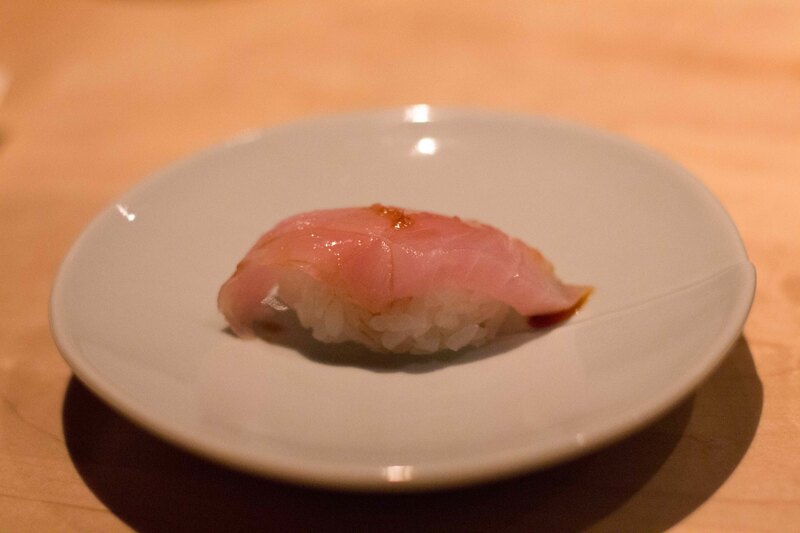 I think I even closed my eyes at this point, just to savour my first piece of nigiri sushi. I was right, the toro was creamy with a nice amount of fat. I also enjoyed the warm, well-seasoned rice. Everything about it was wonderful. 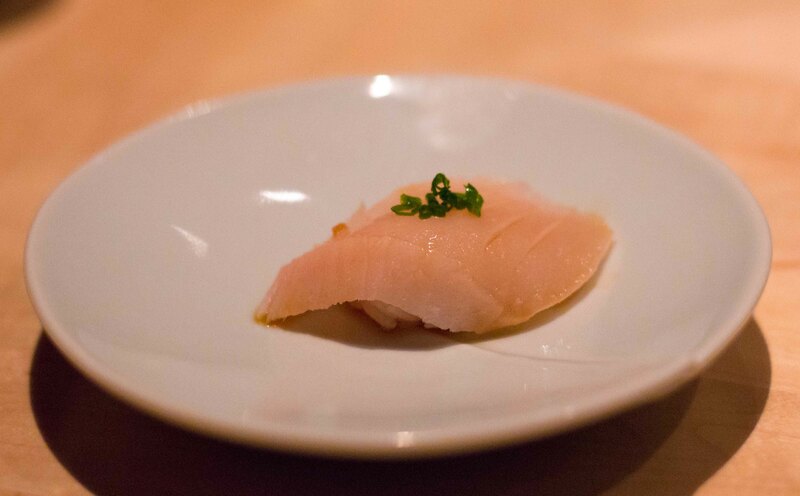 You’ll just have to imagine my first bite, because I was so caught up in the moment that I forgot to take a photo of the toro nigiri. 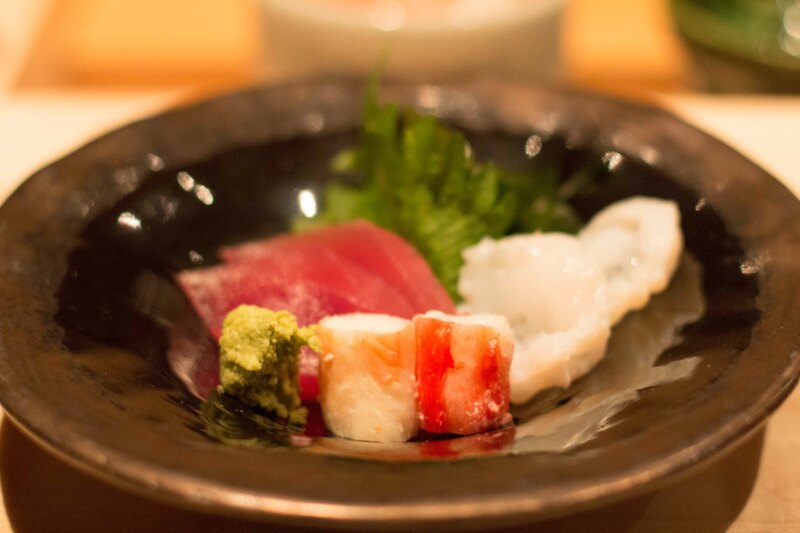 The nigiri sushi was served with good pacing after the toro. There was enough time between each to savour the flavours, but not too much time where you get distracted. 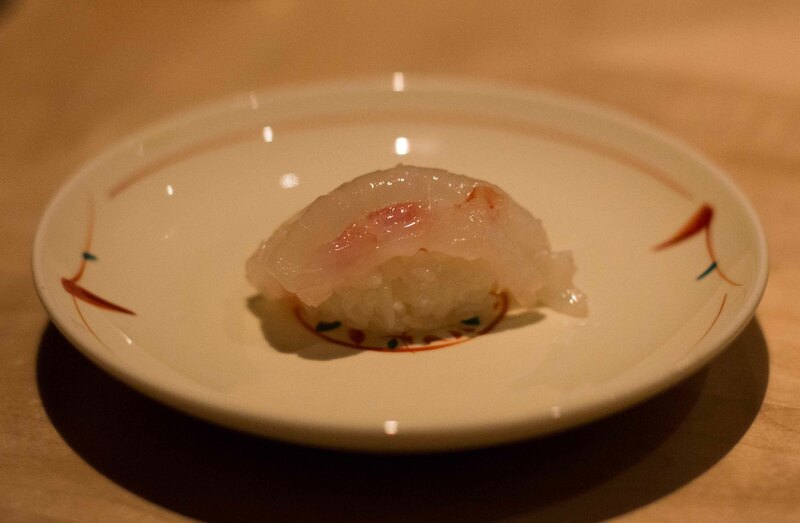 Japanese Shiro Ebi gunkan nigiri was sweet with a nice bite to it. 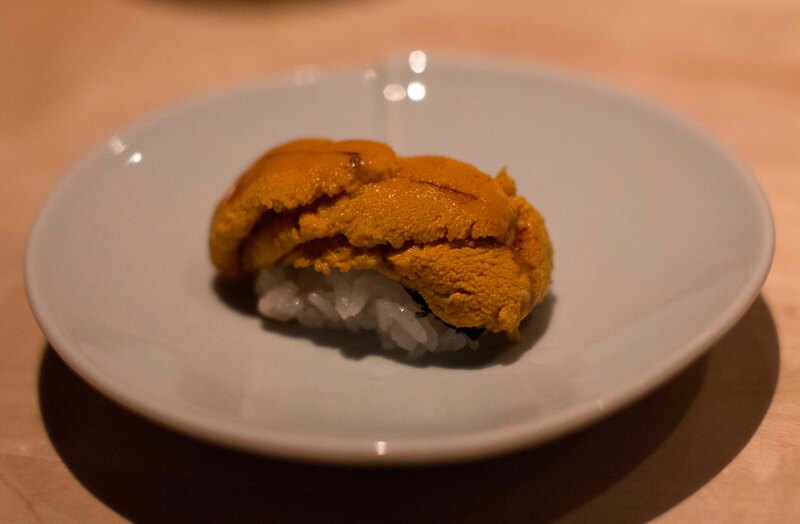 Santa Barbara Uni nigiri was sublime, but I’m biased because when uni is on point, there’s nothing that can beat it. I hoped that I’d have enough room in my belly to order one more of these at the end of night to have one for dessert. 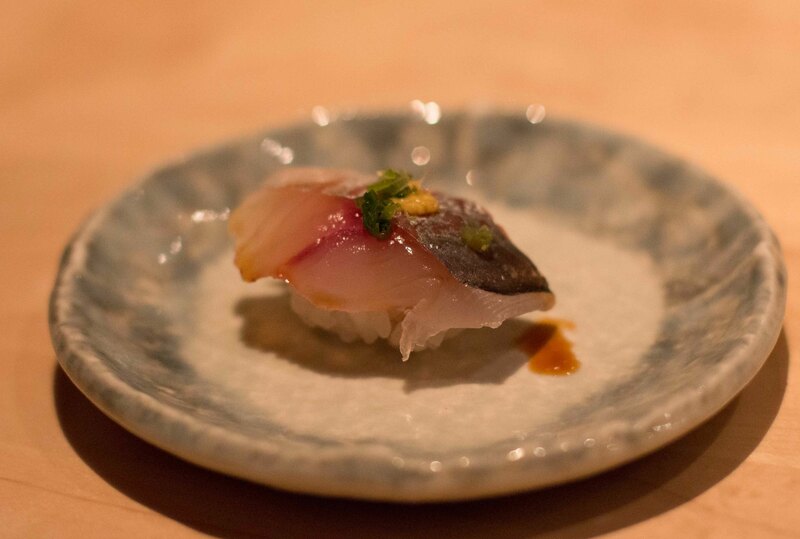 Japanese Aji (Spanish Mackerel) nigiri. Aji topped with scallion and ginger is one of my favourite fish that I can’t get regularly, but one that’s firm in texture but quite subtle in flavour. 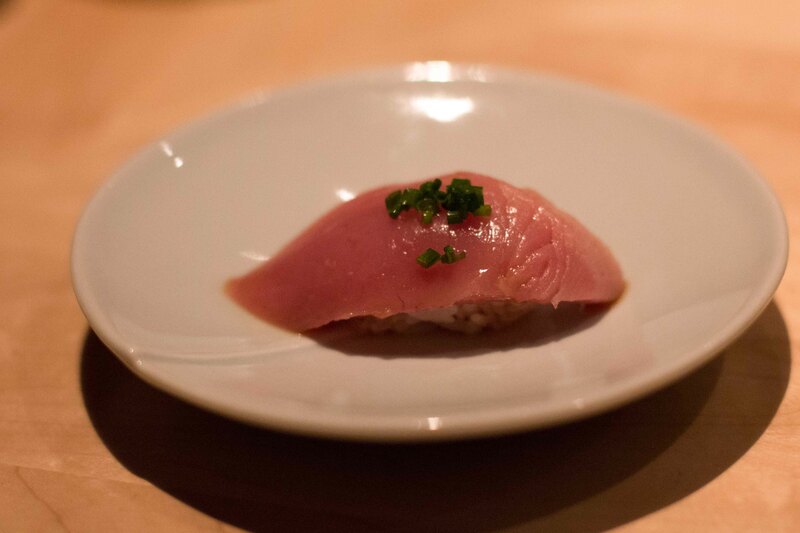 Japanese Katsuo (Bonito) nigiri was the hands down favourite of everyone (other than me) of the night. 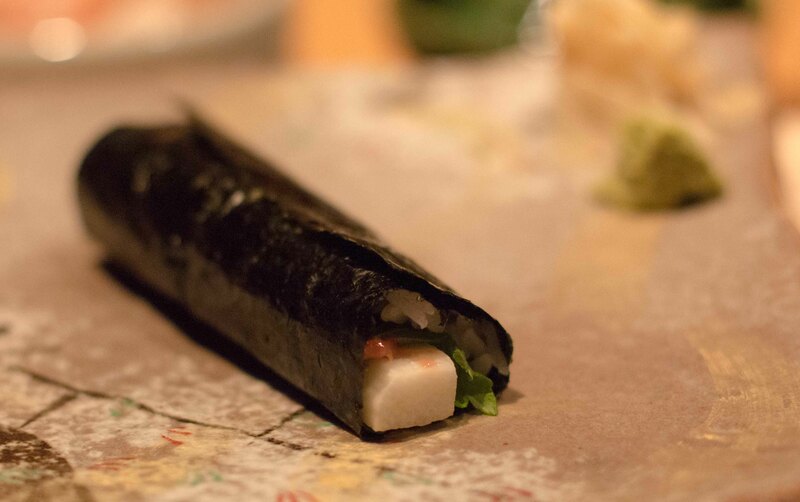 Yamaimo Ume Shiso handroll – Yamaimo = mountain yam, was described as similar to jicama by Fuijita-san. Yamaimo is another one of my favourite things, and combined with ume made me very nostalgic of Japan. 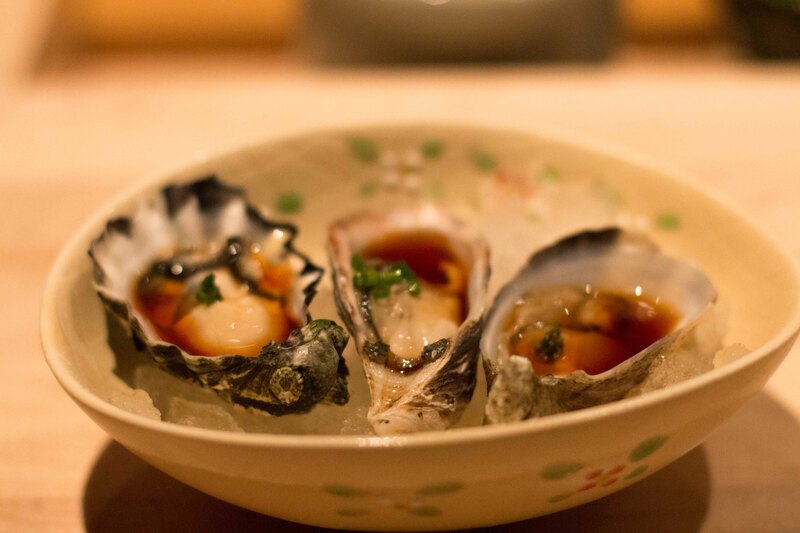 Kumamoto, Kusshi and Shigoku oysters with ponzu and scallion – The 2 others are from Washington, and good, but the Kusshi off the coasts of where I live were the sweetest with a great firm texture. Annkimo (Monkfish Liver) isn’t anything I get at home. 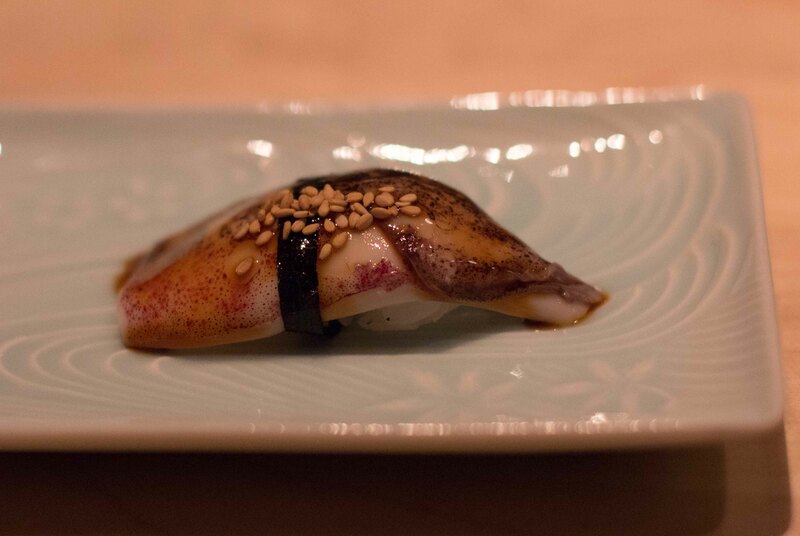 In fact, I think I’ve only ever had ankimo in LA. 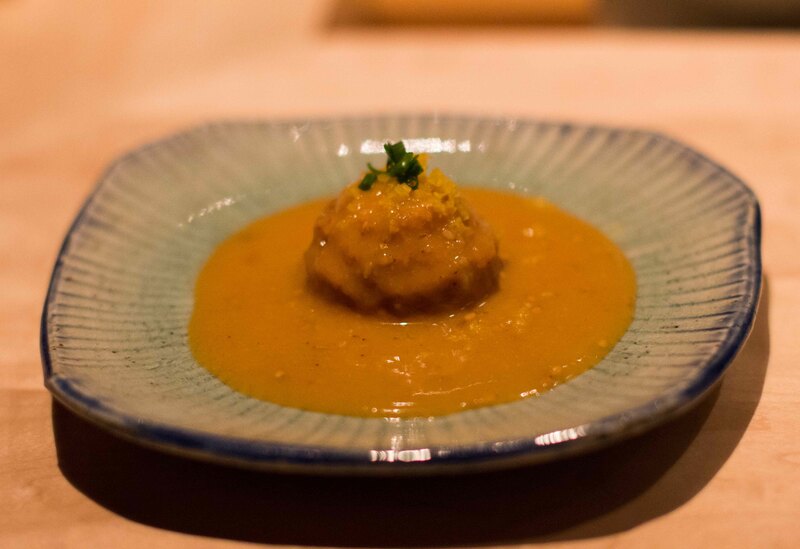 So while everyone else in the room started comparing this to other’s they’ve had, my mind was quietly being blown by this rich and wonderful bite bathed in miso. Maine Lobster nigiri was another surprise. 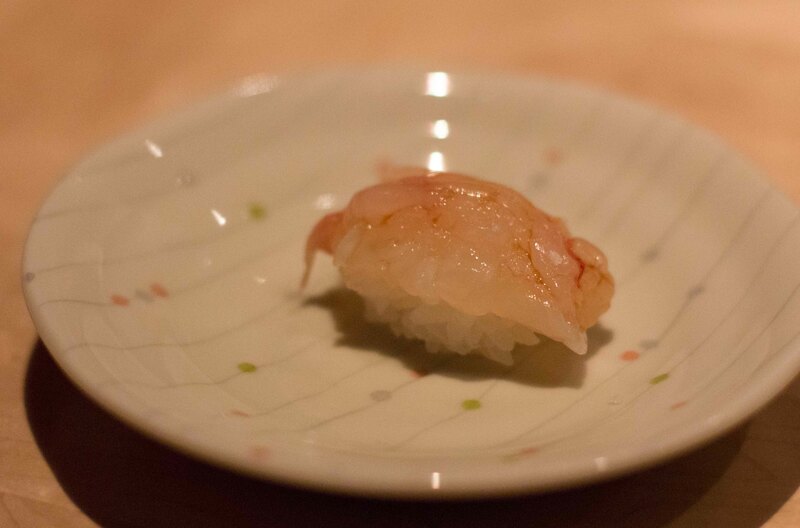 It had the sweetness of ebi, but so much meatier. 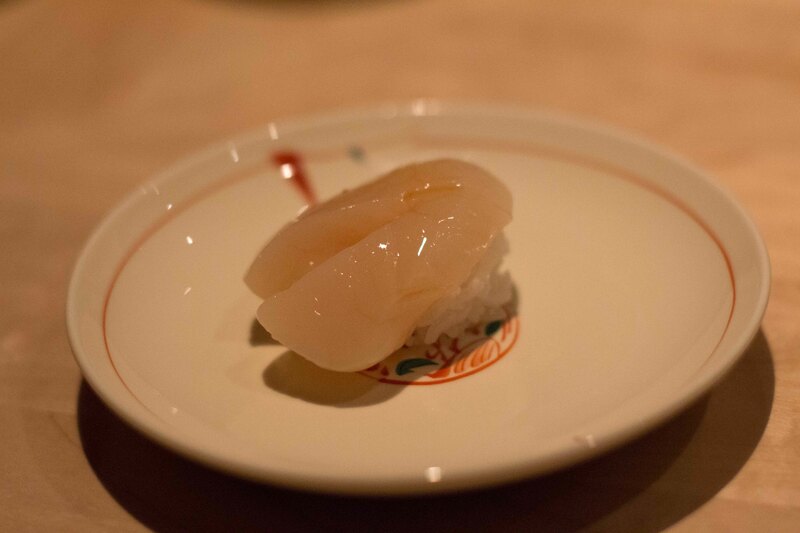 Miruigai (Geoduck) nigiri – I remember being a kid and geoduck was a “garbage” shellfish. My parents would get it for cheap and we’d eat our fill of it. Nowadays, it’s a “delicacy” that immediately makes me smile with nostalgia. 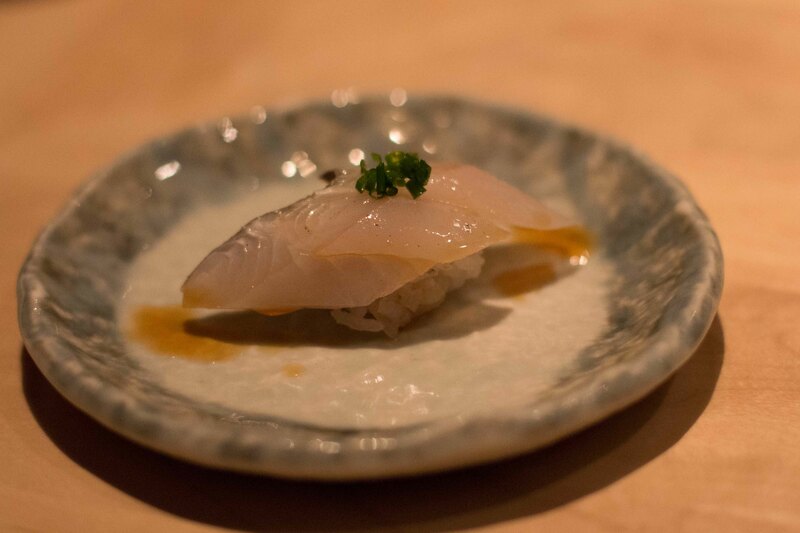 Japanese Tachiuo (Belt Fish) nigiri is another fish I seek out in Japan so I was excited to see it on the menu. Santa Barbara Sweet Shrimp nigiri – all the fantastic fish from Santa Barbara I was served made me put Santa Barbara on the list of places I need to visit soon. Maine Lobster handroll – a variation of the crab handroll that I only seem to have seen in LA. 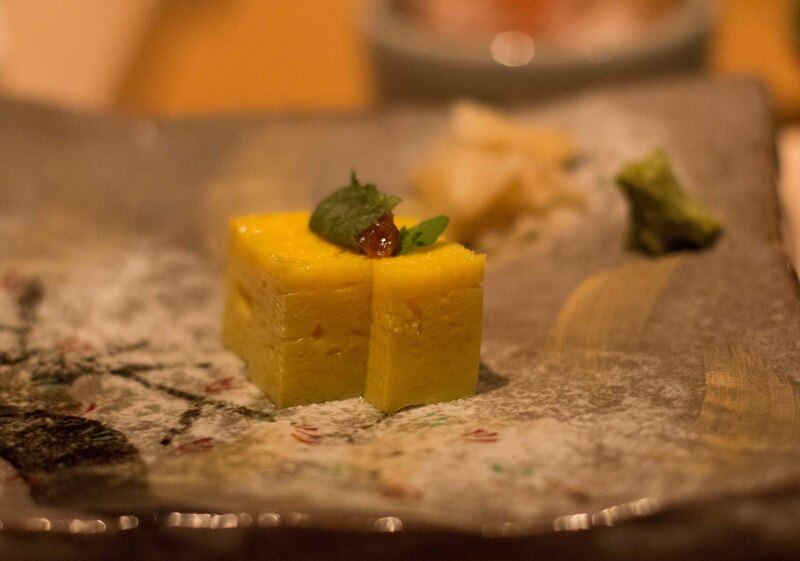 Tamago – I was spoiled at Sushi Kanesaka in Tokyo with “the best tamago I’ll ever have”. Fujita-san’s preparation with ume and shiso on top was unique though. At least if it can’t top what’s “best” in my mind, it’s uniqueness can make me stop. 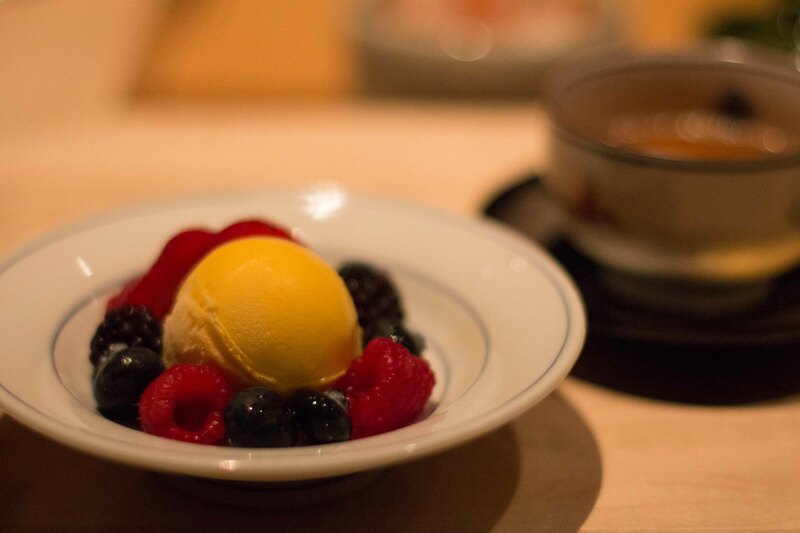 Mango sorbet and Farmer’s Market berries – I would have rathered more fish for dessert but knew my stomach wouldn’t take it. So I had a few bites of dessert with a sip of hojicha tea to clean my palate off for the evening. After all was said and done, I couldn’t believe I had eaten so much food. 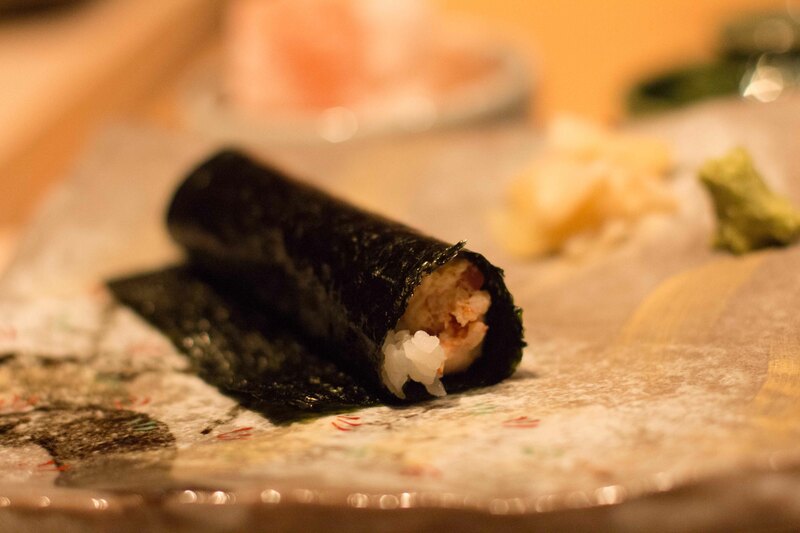 My dinner at Nozawa Bar was the best sushi I can remember having outside of Japan. I knew going in to the meal that I was going to have a good experience. 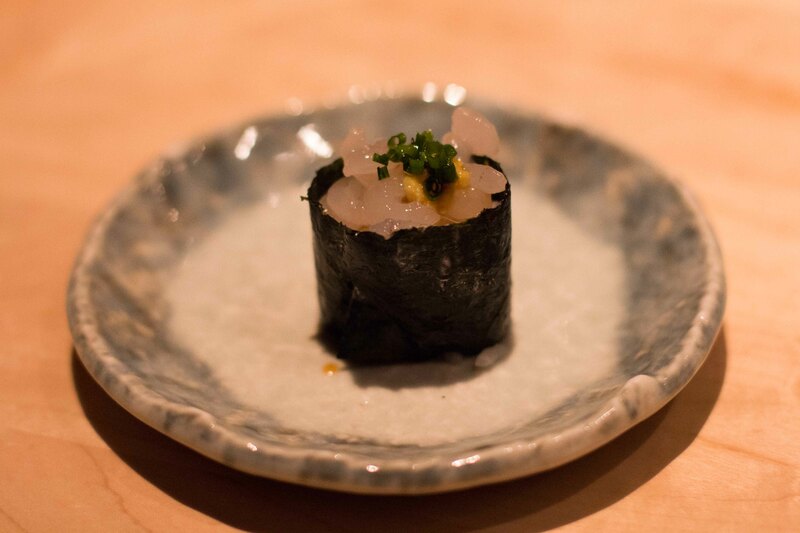 I’m not one to seek sushi outside of Japan, but since my first sushi meal in LA around 15 years ago, I was shown that the quality and standards are not one to look past. I’m happy I sought out this meal because it inspires me to find other great sushi experiences outside of Japan. Arigato Fujita-san for an amazing solitary meal. At the end of the meal the group wanted a commemorative photo of the evening. Felt very Japanese.